Discover where Australia acquired the line in it’s national anthem, ‘nature’s gifts of beauty rich and rare’ when you take to the road on the Great Inland Way. 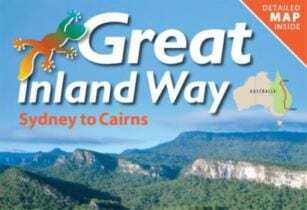 This fully sealed route leads from one natural treasure to another as it weaves its way from Sydney, to the wide-open roads of the outback up through Queensland’s Central Highlands to Cairns, Cooktown and the pristine tropical playground of the Great Barrier Reef. Along its 2691km path, trodden by pioneering men and women, grand masterpieces carefully sculptured by millions of years of nature’s caressing by weather and time, fascinate and enthrall all that see them. The Great Inland Way travels from Sydney to Cairns inland, through Sydney, Bathurst, Orange, Dubbo, Gilgandra, Coonamble, Walgett, Lightning Ridge, St George, Surat, Roma, Injune, Rolleston, Springsure, Emerald, Capella, Clermont, Belyando Crossing, Greenvale, Mt Garnet, Innot Hot Springs, Ravenshoe, Charters Towers, Atherton, Mareeba, Kuranda, Cairns Lakeland and Cooktown.